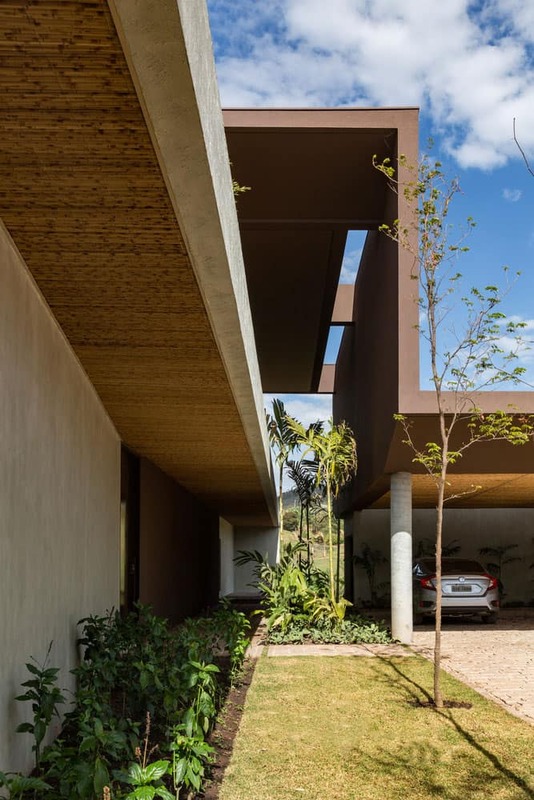 Organic tones and textures define this house in Brazil as it positions itself onto a beautiful landscape. Padovani arquitetos completed this project in 2016 with the intention of showing how materials can benefit the landscape coupled with extensive horizontal lines. The project is located in Sao Paulo’s countryside and spans over 20,000 square metres. It is divided into five cores that help to synchronise the interior and exteriors of the project. The client was awaiting the birth of their twin babies when they commissioned this project. The requirements were that it would be welcoming for the children. Even more important was the requirement that the project totally immerses itself into the surrounding landscape. The projection conditions were dictated by the protagonist landscape. The starting point of the construction was the highest level ground with the best views of the entire land. From there downwards the architects settled into two more levels firmly placing this minimalist and toned work of architecture into place. A dining room, living room, home theatre, seven suites, home office, gourmet space, wine cellar, fitness facility, beach tennis court, pool with a broad panorama, ornamental lake, gymnastics and toys were some of the needed spaces per the clients brief. The use of wood gives the project a certain sense of purity. As the predominant material, it exhibits the sort of synchronous match you want to see between the landscape and an architectural project. This home is nothing short of elegant. The windows are large and generous with daylight distribution. Every single room has more daylight than the next one. The living room in particular has floor to ceiling windows framing the views of the undulating hills far and beyond. The staircase is positioned at an endearing location, designed predominantly from glass and timber and planted into a very organically feeling space with rocks and vegetation on its base. As it leads you up, you cannot help but imagine what scenery awaits you on the next level which opens up into more rooms including the wine cellar. The cellar is decorated with furniture that looks like it showed up right from a 1950s set. The centre of focus in the room is the cellar on a backdrop of beautiful stone walling. The living room and the dining area are graced by the terrace on the outside. The pool and feel of the terrace exhumes the attention to detail as well as imagination of the architects. Minimalist interiors finished in either timber or plastering with exquisite furniture and a ceiling that does not try too hard ensure a less is more philosophy reigns. The landscaping is carefully curated. Some trees jut out from holes on cantilevering slabs to showcase the sophisticated value with which the architects value the natural environment. Interplays between the vegetation and seating areas within the landscape are highly considered. Addition of rocks and mounds of stone in some areas continues to add interest in the whole space. The result is a befitting home for the context with an extremely commanding presence on the landscape that doesn’t feel overwhelming, if anything, it feels like architecture and nature working together.